Thirty years ago today I joined the staff of The Upper Room as assistant editor of Alive Now magazine. I was awarded the generous, extravagant, unheard-of salary of $15,000 per year, after which I went out and bought a car. How can I adequately express my gratitude for these years of formation, of shaping and nurturing my being? To my Saints, living and passed on to the eternal, I give great thanks. To Mary Ruth, John, Rueben, Hoyt, Laura, Moses, Joyce, Henri, Dorothy, Julian, Hildegard, Dietrich, and so many more. To Deen, Stephen, Marjorie, Michael, Janice, Judy, Bill, Don, Jerry, Trevor, Vance, Flora, and too many to name. For retreats and prayer times. For brainstorming sessions and staff training. For laughter and tears. For parties and chapel services. For writing and editing and copy sessions. For print resources and for digital expressions. For immersion in creativity, undergirding our passion to help people grow in their relationships with God. I see myself 30 years ago, and then I look at myself today. I write and talk and think — and don’t remember how I learned the things I know. I know many ways to prayer. I know the wisdom of Christian mystics. I know the ever-increasing hungers for sacred ways of living. I have stayed in this place and been gifted with a culture that values and embraces and teaches these things. This thirty years — my post-graduate work in Christian spirituality. My Ph.D. in the Christian Life. My apprenticeship in growing closer to God. Such nice remembrances! Congratulations on thirty years of service and growth. Many of us have gained from you. Thank you, Dorothy. I’m rich with friendship! Beth, you are the very embodiment of that compassion, creativity and commitment that has characterized Alive Now throughout its years of publication. I remember those early days of our work together with such great fondness and gratitude. Oh, my dear friend. Thank you. You are a beloved friend, mentor, and companion on the journey. Thank you, Mary Ann. I will miss the paper copy as well!! Thanks for the congratulations. Blessings! Beth, you have blessed so many with your work and we grieve with you as these changes come hard one on another. We also thank God for the gifts that are to be revealed in the days and weeks ahead. I pray that you will feel our prayers holding you and the staff up a you walk this new part of the journey. Thank you, Myscha. I am feeling so blessed by all of you. What a beautiful capturing of 30 years of spiritual and editorial work – in a way that only Beth can write it! 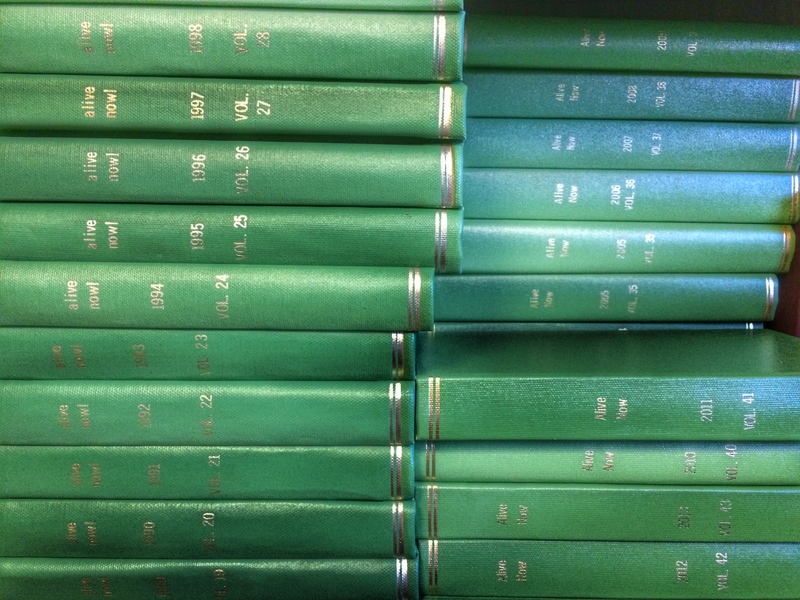 Thank you for helping us reminisce – enhanced by the photo of all those bound volumes of Alive Now! (I remember when the title included the “!”) I am missing my print copy already. I hold onto the current one a little closer – and will add it to my collection.